Welcome to Nissan 2018 – What's New. This document will be updated regularly, creating a one-stop shop for the most up-to-date Nissan vehicle lineup news. Watch for updates on Nissan vehicles as they become available, and, as always, check in regularly with www.nissannews.com for the latest news on Nissan sales, pricing, motorsports and other activities in the United States and around the world. Calendar year 2018 has finally arrived and with it comes a new edition of What's New – complete with updates on nearly all the changes for the new model year. Headlining the changes are the all-new second-generation LEAF, the all-new Nissan Kicks and some exciting new technologies in support of Nissan Intelligent Mobility, a global initiative that focuses on how Nissan vehicles are driven, powered and integrated into society. And, to help you through the dark days of winter, the hot-selling blackout treatment Midnight Edition lineup has expanded to nine nameplates – including the snow-worthy TITAN, TITAN XD and Frontier 4x4s. This January update adds information on the 2018 Maxima, Rogue, Rogue Sport, GT-R, TITAN, TITAN XD, Sentra, Murano, NC200, NV Cargo and NC Passenger vans – and previews the upcoming Nissan Kicks, which made its debut at the 2018 Los Angeles Auto Show. Information on the Rogue Sport will be added at a later date. You'll also find previously released details on three new technologies – ProPILOT Assist, Rear Door Alert (RDA), Intelligent Rearview Mirror (I-RVM), and Automatic Emergency Braking (AEB), which is now standard on a projected one million vehicles sold in the United States for model year 2018. As always, full information on all Nissan vehicles is available online at www.nissannews.com. And stay tuned for additional What's New updates as they become available. The all-new 2018 Nissan Kicks, the newest entry in the fast-growing affordable compact crossover market, becomes the sixth member of the Nissan crossover and SUV line-up – which has experienced record sales in recent years. It hits Nissan U.S. dealerships in June 2018. The new 2018 Kicks combines emotion and practicality by blending bold wheel arch fenders and high crossover stance with familiar Nissan design signatures, including a V-Motion grille, boomerang headlights and taillights and floating roof with a "wrap-around visor" look. Available exterior features include standard Intelligent Auto Headlights (I-AH) and available LED low-beam headlights with LED signature accents. The 2018 Kicks will be offered in a range of seven exterior colors – plus five two-tone combinations. Inside, Kick's simple "Gliding Wing" dashboard design is dominated by a centrally mounted 7.0-inch full color display housing a comprehensive infotainment system with Apple CarPlay™ and Android Auto™ smartphone connectivity. For the ultimate audio experience, the Kicks SR Premium Package includes the new class-exclusive 1 Bose® Personal® Plus sound system with a pair of lightweight 2.5-inch Bose® UltraNearfield™ neodymium speakers located inside the Kicks' driver's seat headrest. Among the other on-board technology, Kicks features an available Intelligent Around View® Monitor (I-AVM). Every 2018 Kicks comes with a standard 1.6-liter DOHC 16-valve 4-cylinder with Continuous Variable Valve Timing Control System (CVTCS). The engine is rated at 125 horsepower and 115 lb-ft of torque. Combined with a smooth, fuel-efficient Xtronic transmission. Kicks is offered in front-wheel drive only. Safety, security and driver convenience features are strong points for Nissan Kicks. Automatic Emergency Braking (AEB) is standard on all grade levels, along with seven air bags and RearView Monitor. Kicks SV and Kicks SR add Blind Spot Warning (BSW) and Rear Cross Traffic Alert. The 2018 Nissan Kicks will be offered in three well-equipped models – Kicks S, Kicks SV and Kicks SR. Pricing for the 2018 Nissan Kicks will be announced closer to its on-sale date in spring 2018. AutoPacific segmentation. Available feature. 2018 Kicks vs. latest in-market competitors in XSUV Compact Class. Based on manufacturers' websites. For the 2018 model year, the Nissan Maxima once again receives additional enhancements to its award winning design. Now in its eighth generation, which was completely revised just two years ago, Nissan's flagship sedan features standard Android Auto™ (in addition to standard Apple CarPlay™), a revised color palette including new Carnelian Red color and a new black accent added to its dramatic V-motion grille. In addition, the popular Maxima SR Midnight Edition package features revised content – including the advanced Intelligent Driver Alertness (I-DA) system previously available only on the Maxima Platinum grade, making it an even better value than before. Also, the 2018 Maxima carries over the late 2017 model year additions of standard Intelligent Forward Collision Warning (I-FCW) and Automatic Emergency Braking (AEB) on all grade levels. The 2018 Maxima is available in five well-equipped models: Maxima S, SV, SL, SR and Platinum – each equipped with a 300-horsepower 3.5-liter VQ-series V6 engine and performance-oriented Xtronic transmission. MSRP excludes applicable tax, title, license fees and $885 USD destination charges. Dealer sets actual price. Prices and specs are subject to change without notice. For the 2018 model year, Rogue is on the move again – led by the addition of available ProPILOT Assist 1 technology, which provides assisted steering, braking and accelerating during single-lane highway driving. ProPILOT Assist is the foundation for the autonomous vehicles of the future, helping drivers stay centered in the lane, navigate stop-and-go traffic, maintain a set vehicle speed and maintain a set distance to the vehicle ahead. And, it is all done with a simple two-button operation. ProPILOT Assist is available on the 2018 Rogue SL grade as part of the Platinum Package. The 2018 Rogue is offered in three well-equipped grade levels, S, SV and SL. All models are equipped with a responsive 2.5-liter 4-cylinder engine rated at 170 horsepower and 175 lb-ft or torque. The engine is matched with an advanced Xtronic transmission with standard Sport Mode and Eco switches. ProPILOT Assist: It is the driver's responsibility to remain alert with hands on steering wheel, keeping a look out for other vehicles and pedestrians at all times. MSRP excludes applicable tax, title, license fees and destination charges. Dealer sets actual price. Prices and specs are subject to change without notice. Destination and handling $975. The Nissan Rogue Sport, which joined the Nissan crossover and SUV lineup near the end of the 2017 model year, enters 2018 with just a few refinements to its optional package naming and content. The new SV Technology Package (previously named the SV Premium Package) now includes the contents of the previous SV All-Weather Package, including Quick Comfort ® heated driver's and front passenger seats, Remote Engine Start System with Intelligent Climate Control, heated leather-wrapped steering wheel, fog lights, leather-wrapped shift knob and heated outside mirrors. The SL Premium Package now includes the content of the previous SL Platinum Package – including Intelligent Cruise Control (ICC), Lane Departure Warning (LDW), Intelligent Lane Intervention (I-LI), and Automatic Emergency Braking with pedestrian detection. Again in 2018, Rogue Sport shares many of the design, utility and technology attributes that have made Rogue Nissan's best-selling vehicle in the United States. Rogue Sport is slightly smaller, sportier and more affordable for younger, urban SUV buyers than Rogue. These buyers are looking for much more space than a compact sedan, while still seeking the maneuverability and fun-to-drive feel that Rogue Sport delivers. The 2018 Rogue Sport is offered in front-wheel and Intelligent All-Wheel Drive configurations, and in three well-equipped grade levels – S, SV and SL. Rogue Sport is assembled in Kyushu, Japan. Following last year's significant enhancements to the iconic Nissan GT-R – which included a refreshed look inside and out and 20 additional horsepower – the changes continue for the 2018 model year with the introduction of a new GT-R Pure model, the addition of Apple CarPlay™ to NissanConnect SM with Navigation and Services, and a new black "Kuro Night" color for the Premium Interior Package. With a starting MSRP 1 of $99,990, the 2018 GT-R Pure model is designed to be the most affordable of the four GT-R trim levels. The differences between the Pure and Premium grade, which is priced at $110,490, includes an 11-speaker Bose® audio system, Active Noise Cancellation and Active Sound Enhancement systems, and Titanium exhaust system. The GT-R Track Edition, now in its second year of limited availability, is designed to deliver a higher level of performance than the GT-R Pure and Premium models and features elements of the flagship GT-R NISMO. The GT-R Track Edition retains the GT-R Premium model's 565-horsepower engine rating (versus the GT-R NISMO's 600-horsepower rating). It has a starting MSRP of $128,490. The ultimate GT-R, the motorsports-inspired GT-R NISMO, is available in very limited numbers in North America. It features numerous motorsports-inspired technologies to enhance the car's performance through optimized aerodynamics, suspension and powertrain, creating a well-balanced machine at home on both the road and track 2. The GT-R NISMO is priced at $175,490. MSRP excludes applicable tax, title, license fees and $1,695 USD destination charges. Dealer sets actual price. Prices and specs are subject to change without notice. Damage resulting from racing, competitive driving, track and/or airstrip use not covered by warranty. See your New Vehicle Limited Warranty and Owner's Manual for proper vehicle operation and complete warranty details. For 2018, Nissan offers a full range of rugged TITAN half-ton pickups, including Single Cab, King Cab and Crew Cab body configurations, 4x2 and 4x4 drive, and a choice of up to five grade levels. Every TITAN is powered by a 390-horsepower 5.6-liter Endurance ® V8 gasoline engine mated to a 7-speed automatic transmission. The 2018 TITAN also offers cutting-edge available towing, utility features and driving aids, including an Integrated Trailer Brake Controller, Trailer Sway Control (TSC), Tow/Haul Mode with Downhill Speed Control and a Trailer Light Check system that allows one-person hook-up operation – including checking turn signals, brake lights and running/clearance lights. It offers an available maximum towing capacity of 9,740 pounds and maximum payload capacity of 1,950 pounds when properly equipped. Available technology features include Intelligent Around View ® Monitor (I-AVM), NissanConnectSM with Navigation, a 7.0-inch color touch-screen display, SiriusXM® Traffic and Sirius Travel LinkTM (SiriusXM® subscription required, sold separately), Siri® Eyes Free, Nissan Voice Recognition for navigation and audio, Blind Spot Warning (BSW), Rear Cross Traffic Alert (RCTA) and RearView Monitor. The 2018 TITAN is available in a range of nine Crew Cab, five King Cab and four Single Cab drive and grade configurations. 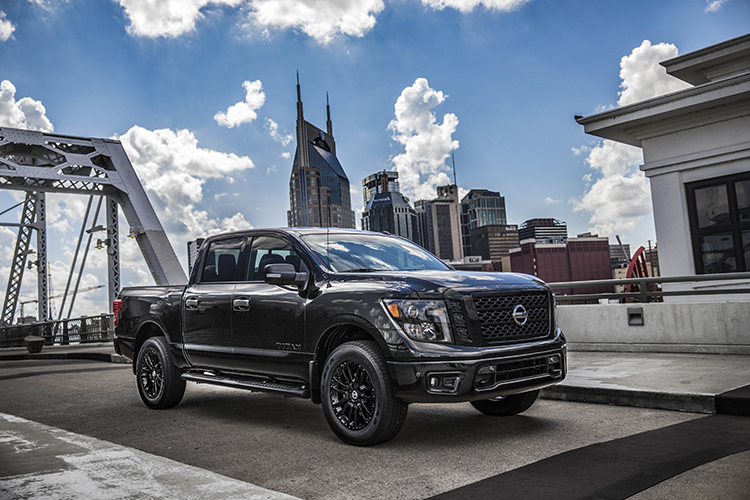 All 2018 TITAN models are covered by Nissan's "America's Best Truck Warranty" 1 – featuring bumper-to-bumper coverage of 5-years/100,000-miles, whichever comes first. Vehicles covered by the new warranty, which includes basic and powertrain coverage, include all TITAN V8 gasoline-powered models and diesel and V8 gasoline-powered 2018 TITAN XD models. Note: All models are equipped with a 5.6-liter Endurance ® V8 and 7-speed automatic transmission. Destination and handling $1,295. Ward's Segmentation. 2018 TITAN vs. latest in-market Large Pickup Segment competitors. Based on Standard Horsepower. Base models compared. Based on manufacturer websites. Claim based on years/mileage (whichever occurs first) covered under the New Vehicle Limited Warranty basic coverage. Ward's in-market Large Pickup Segmentation and Small Pickup Segmentation v. 2018 TITAN and TITAN XD. Nissan's New Vehicle Limited Warranty basic coverage excludes tires, corrosion coverage and federal and California emission performance and defect coverage. Other terms and conditions also apply. See dealer for complete warranty details. Warranty claim is current at time of printing. MSRP excludes applicable tax, title, license fees and destination charges. Dealer sets actual price. Prices and specs are subject to change without notice. Destination and handling $1,295. When it was first introduced in 2016, the Nissan TITAN XD shook up the highly competitive full-size pickup segment in the United States and Canada with a bold design and capabilities that staked out a unique position in the segment between traditional heavy-duty and light-duty entries. TITAN XD offers some of the effortless towing and hauling of the larger, more expensive heavy-duty trucks – including an available maximum towing capacity of 12,310 pounds and maximum payload capacity of 2,080 pounds (when properly equipped) – yet with fuel-efficiency and affordability closer to a half-ton pickup. Now in its third year, the 2018 TITAN XD continues to stake out unique territory with a lineup that includes Crew Cab, King Cab and Single Cab body styles, two bed lengths, choice of a powerful Cummins ® 5.0L V8 Turbo Diesel or Nissan 5.6-liter Endurance® V8 engines, 4x4 or 4x2 drivelines and up to five well-equipped grade levels. TITAN's truck innovation leadership continues with cutting-edge available towing, utility features and driving aids, including an Integrated Trailer Brake Controller, Trailer Sway Control (TSC), Tow/Haul Mode with Downhill Speed Control and a Trailer Light Check system that allows one-person hook-up operation – including checking turn signals, brake lights and running/clearance lights. Also assisting trailer hook-ups is the TITAN XD's RearView Monitor with Trailer Guides and available Intelligent Around View ® Monitor (I-AVM). For 2018, TITAN XD adds a new Midnight Edition Package available on Diesel Crew Cab SV and SL grade 4x4 models, providing a custom look straight from the factory. The TITAN Midnight Edition Package includes body color front grille with dark insert, dark headlamps, black fog lamp finisher, black exterior badging, black mirrors, black door handles, 20-inch black wheels, body color front and rear bumpers, black step rains, black interior trim and "Midnight Edition" exterior badge. The 2018 TITAN XD Gas is available in a range of nine Crew Cab, five King Cab and four Single Cab drive and grade configurations. All 2018 TITAN XD models are covered by Nissan's "America's Best Truck Warranty" 1 – featuring bumper-to-bumper coverage of 5-years/100,000-miles, whichever comes first. Vehicles covered by the new warranty, which includes basic and powertrain coverage, include all TITAN V8 gasoline-powered models and diesel and V8 gasoline-powered 2018 TITAN XD models. Note: All models are equipped with a 5.6-liter Endurance ® V8 and 7-speed automatic transmission. Destination and handling $2,195. Note: Note: All models are equipped with a Cummins ® 5.0L V8 Turbo Diesel engine and 7-speed automatic transmission. Destination and handling $1,295. The Nissan Sentra continues to be one of the brand's top sellers and most recognized nameplates – a mainstay in the compact sedan segment for more than 35 years and seven generations. For the 2018 model year, Sentra receives a number of enhancements designed to up its already strong desirability equation – including the continuation of the high value SR Midnight Edition Package introduced in mid-2017. The 2018 SR Midnight Edition Package features 17-inch black aluminum-alloy wheels, black heated outside mirrors, black rear spoiler, black license plate finisher, black V-motion grille, black fog lamp surrounds, black exterior name/grade badges and black Midnight Edition badge. lineup includes Sentra S (6MT and Xtronic), Sentra SV (Xtronic), Sentra SR (Xtronic), Sentra SL (Xtronic), SR Turbo (6MT and Xtronic) and Sentra NISMO (6MT and Xtronic). As the halo vehicle for Nissan's wide range of bold crossovers and SUVs, Murano expresses Nissan's advanced design direction – including its V-motion front end, LED signature boomerang lights and the unique "floating" roof. There is more to the Nissan Murano than just design leadership, however. In 2017, for the third year in a row, Murano was named by U.S. News & World Report as the "2017 Best 2-Row SUV for the Money." Murano was also honored in the J.D. Power 2017 U.S. Automotive, Performance, Execution and Layout (APEAL) StudySM as the top vehicle in the Midsize SUV category. Responsive driving is once again provided by a 260-horsepower 3.5-liter DOHC V6 connected to an advanced Xtronic transmission. The 2018 Murano is available in front-wheel drive or Intuitive All-Wheel Drive and in four well-equipped grades Murano S, Murano SV, Murano SL and Murano Platinum. MSRP excludes applicable tax, title, license fees and $975 USD destination charges. Dealer sets actual price. Prices and specs are subject to change without notice. The 2018 Nissan Compact Cargo is designed to help business owners navigate their way through the challenges of tight spaces and tight deadlines – combining a small exterior footprint and excellent fuel efficiency with a large cargo capacity and outstanding versatility. Powering the front-wheel drive NV200 Compact Cargo is a 131-horsepower 2.0-liter inline 4-cylinder engine matched with an Xtronic transmission. The NV200 Compact Cargo is offered in two grades, S and SV, along with a number of option packages that allow buyers to create the exact package for their specific business needs. It is available through Nissan dealers nationwide. Every 2018 NV200 Compact Cargo also offers America's best commercial van warranty1, with basic limited warranty coverage of 5 years/100,000 miles, whichever comes first. The powertrain limited warranty is also 5 years/100,000 miles, whichever comes first. Claim based on years/mileage (whichever occurs first) covered under the New Vehicle Limited Warranty basic coverage. 2018 Nissan NV Cargo, NV Passenger v. 2018 Large Van Class; 2018 Nissan NV200® v. 2018 Small Van Class. Commercial Vans compared only. Nissan's New Vehicle Limited Warranty basic coverage excludes tires, corrosion coverage and federal and California emission performance and defect coverage. Other terms and conditions apply. See dealer for complete warranty details NV200® Taxi is covered under a separate limited warranty with a different level of coverage. The highly innovative Nissan NV Cargo is available in three models: NV1500, NV2500 HD and NV3500 HD, and in two roof configurations – Standard Roof and High Roof. Powering the rear-wheel drive Nissan NV Cargo is a choice of two powerful yet fuel-efficient engines – a 4.0-liter V6 and 5.6-liter V8. For the 2018 model year, all NV Cargo grades come equipped with standard RearView Monitor, 5.0-inch color display audio, Bluetooth ® Hands-free Phone System, Streaming Audio via Bluetooth, Hands-free Text Messaging Assistant and USB connection port for iPod interface and other compatible devices. In addition, the previous Power Package option content – power windows with driver's side one-touch down, power door locks with central locking, auto door lock function, Remote Keyless Entry – is now standard on S grade. The 2018 4-row/12-passenger Nissan NV3500 HD Passenger Van is ideal for both personal and fleet use. It features flexible seating configurations, roof-mounted curtain supplemental air bags with rollover sensors for side-impact and rollover head protection for all outboard passengers, and standard headrests and integrated seat belts for all rear seating positions.